I know right? Cauliflower Tacos? Seriously? But dude – I’m not kidding, you have GOT to try this “taco meat” mixture of cauliflower and mushrooms. With just the right amount of spices, you will NOT believe you’re eating a vegetable. It’s uncanny! And it’s SO GOOD! And for all you men folk out there – Guys, I hear you. I HATED cauliflower too before I went Vegan. I was a strict corn, peas, and potatoes kind of guy. But when I first started messing around with baked cauliflower – like in my Orange Chicken Recipe…..I thought to myself…….hey – this stuff really ain’t half bad…..
And now? With this recipe for making Cauliflower Tacos? I am a complete convert! Brothers and sisters can I get an amen? I mean this stuff is flipping AWESOME. It even LOOKS like hamburger meat! 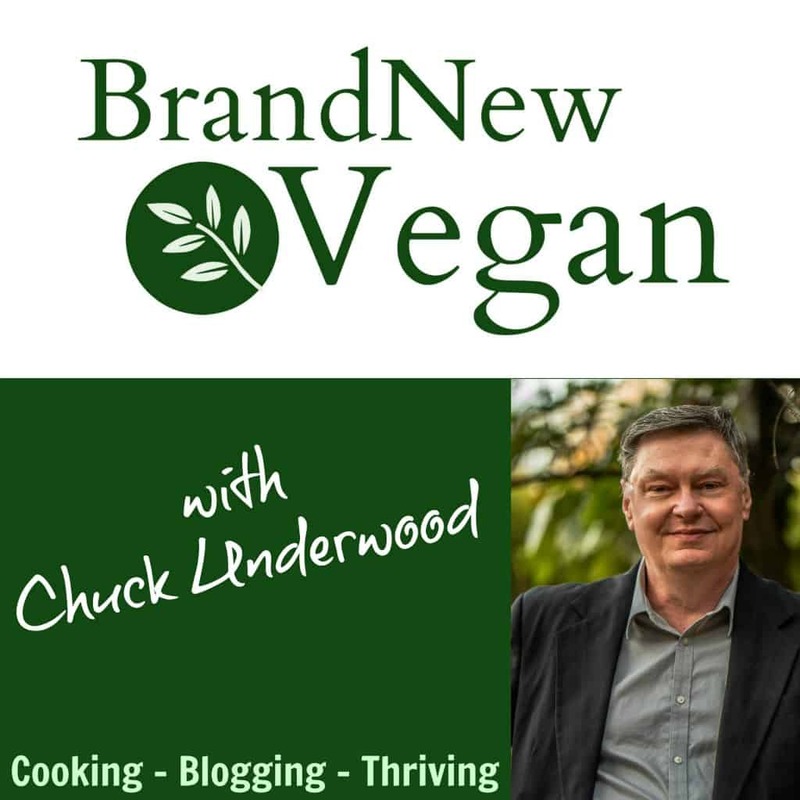 For those of you “Not in the Know”…..That’s what Brand New Vegan is all about. I make recipes that allow you ease your way into a plant-based diet. And I do that by making the foods you’re already used to a whole lot healthier. I call it “Vegan comfort food” and I guarantee it’s a whole lot healthier than any of that pre-packaged stuff in the store. And to me – nothing says comfort food like homemade Tacos. Throw on some fresh tomatoes right out of the garden, and some of that Green Chile Sour Cream I made a while back? Maybe a splash or two of my homemade Taco Bell Fire Sauce? If you have a food processor – this is going to be REALLY easy. And if not – well you can still do it, but you’ll have a lot of chopping to do. We’re going to process a small head of cauliflower until it resembles the size and texture of ground beef – or rice if that’s easier to picture. Same with the mushrooms, and I used about 4 oz of Cremini Mushrooms. That’s about half of one of those packages you see in your grocery store. And I also added 1 cup of Walnuts to my mixture for even better texture. Walnuts also add a healthy dose of Omega 3 Fatty Acids but if you’re allergic to nuts or just don’t want the added fat – leave them out. Once you’ve got everything processed in a large bowl , stir in 2 Tablespoons of Soy Sauce and mix well. And then stir in all the spices, making sure everything’s mixed thoroughly. Now we just spread our mixture onto a parchment lined cookie sheet and bake at 350° F for 30 minutes. Remove from the oven and stir things up a bit and then bake for an additional 10-15 minutes. Someone has already asked me about compliant Taco Shells…..and by compliant I am assuming they meant “oil-free”. You can buy Oil Free Corn Tortillas at just about any grocery store. Then it’s just a matter of shaping them and baking them until they’re crispy. One popular method is to drape a corn tortilla over several rungs of your oven rack – letting them hang upside down – and bake until crispy. Google Oven Rack Taco Shells…..the photos are everywhere, or if nothing else you could just bake them flat and make Tostadas. Now let’s go make some Tacos! These Cauliflower Tacos will blow your mind they are so good. Trying to get your picky eaters to eat more veggies? They'll never know the difference ! Garnish with Lettuce, Tomatoes, Jalapeños, or Avocado. 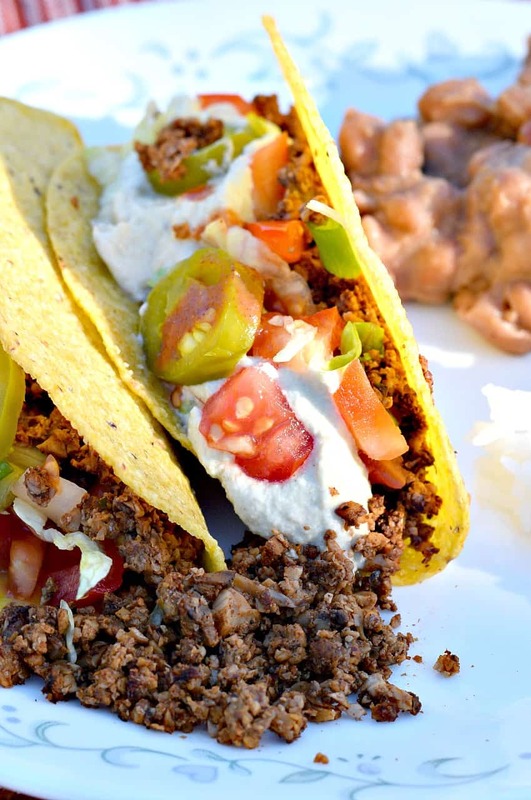 My Green Chile Sour Cream goes very well with these tacos as does my Taco Bell Fire Sauce. Sorry people but I’m a kitchen moron. What is the difference between tbs and Tbs???? None……. TBS is a tablespoon. tsp is a teaspoon. This is very tasty with lots of rich umami flavor. I usually eat seasoned bean tacos with tons of veggies but this is good combined with the beans or by as-is with the veggies. Better tasting than Beyond Meat’s crumbles for sure and so, so, so much healthier for those eating WFPB! Next time I’ll try your taco pie. Thank you, Chuck!! #Rosie Bragg, the question asked was what is the difference between TBS and tbs. Not TBS and tsp as you assumed. I prefer to write TBS for tablespoon and tsp for teaspoon so my tired eyes don’t get confused! Looks great! Does it freeze and reheat ok? Definitely reheats well. Not sure about freezing. It does freeze and reheat well. I took the frozen mixture on a camping trip and everyone was shocked it was vegan. Thank you! I was just about to ask if it froze well. I have made this and it freezes just fine! Could I use sunflower seeds in place of the walnuts? I would like to know the answer as well. I haven’t tried this recipe yet, but I have a nut allergy and was considering trying sunflower seeds as well. But I was thinking maybe hulled pumpkin seeds (possibly roasted) might be a better option. There’s a local taco place near me that tops their black bean tacos with roasted pumpkin seeds. It adds some texture without having to strong of a flavor flavor (which I think sunflower seeds might). I think it would make a perfectly fine replacement – they are there mainly for texture. Just a note to tell you that we made this recipe tonight and it was fantastic! My teenaged daughter — a very picky eater — bragged about how good it was to her friends in their online chat group afterwards 🙂 Our big Kroger’s grocery store weirdly did not have cauliflower heads when I was shopping yesterday, but it did have packaged cauliflower already “riced” for quick use. This made the process of putting the recipe together even easier. Chuck you are brilliant! I made this yesterday and there was not a drop of it left. I also made it with fresh riced cauliflower from Trader Joes. Hubs said that was the “best stuff” he had had in a long time. Awesome! So glad you (and hubs) liked it! I believe that ‘compliant’ tortillas would be organic, no GMO. A real corn tortilla is made of corn, lime and water only. I heat my tortillas in a pan with a little oil, just enough to make them pliable. It’s quick, easy and how most people in my region of California eat them. I made the recipe and it was as good as you said. The spices, ingredients and the time in the oven was perfect. I didn’t have any garlic salt or onion powder so I just used a couple cloves of garlic and some green onions along with some jalapenos I had hanging around and tossed them in to the mix. The timing in the oven stayed the same even with the extra stuff. My friends came over and we had tacos and everyone raved about them. None of us are vegans or vegetarians, but we love trying new things. Everyone wanted to know where I found the recipe, so I shared your site with them. I am excited to try more vegan recipes on your site. Thanks! Wow, this was delicious! I hate mushrooms but I loved this so much! I served our tacos with lettuce, tomato, cheese, sour cream, and hot sauce. My husband and I loved it so much, thanks for the great recipe! Wow, So I was specifically reading the comments to see if there was another mushroom hater. Because I loathe them…I was thinking to sub beans for the mushrooms…but am interested that you actually liked it with the mushrooms. I don’t know…I may just stay with the beans idea, so I don’t risk ruining the recipe…because I reallllly don’t like mushrooms, and it’s funny how many “vegan” recipes incorporate them…when I say I’m WFPB people assume I love mushrooms. Tried this tonight for the first time! Oh my! This is definitely better than ground beef tacos. There is so so so much flavor and I love the texture of the “meat”. My daughter said she could eat a thousand of these tacos. Thank you for this excellent recipe! I ran out of cashews for the green chile sour cream so I made tofu sour cream instead. I charred my chilies and then added to the blender. Loved it! I just made these tonight. Crazy good! Thanks for all of your inspiration and terrific recipes. Made these tonight. AMAZING!!!!! We gobbled them up. And after having a couple tacos, my husband and I just stood over the pan and ate the rest lol. This is going to be my go to base for many ‘ground beef’ meals. Thanks for sharing! I have a guestions about the walnuts. My husband has a problem with them they make his mouth swell. Can they be traded for something else or just left out? I have a Ranch Dressing on my blog! this looks like it makes so much. Has anyone tried freezing this or saving it? I have frozen it with success. Seriously, these are the biggety bomb! They are so, so good! Can’t wait to try this recipe! Another way to make tostada shells is to place 2 or 3 corn tortillas on a plate and microwave them for 1:45 – 2:00. So delicious! I didn’t have time to roast it in the oven, so cooked it in a large saucepan for I think about 20 minutes. I know the flavor and texture were different than if I had done it in the oven, but we still absolutely loved it. The recipe made a ton, and the leftovers reheated just as delicious as at first. While it’s great that I was able to cook it faster on the stove, I can’t wait to try it roasted! My local Costco carries fresh riced cauliflower, how much volume do you normally get from the head of cauliflower if I wanted to sub the already ground stuff? How much does this make? Looking to make it for a luncheon and need to know numbers. Thanks! Oh boy! These tacos were AHHHMAZZZING!!!!!!!!!!! Thank you for such a great recipe!! Do you have to add mushrooms? Don’t like the taste of them at all lol! Thanks! Nope – leave them out if you want. No worries. You could use eggplant instead. I don’t like to eat mushrooms either, knowing what they grow them on. I made these for dinner tonight but instead of tacos i made burritos. I made my wraps using a cooked sweet tater and as much ww flour as needed to make a dough. I roll them out thin and cook them in a dry pan over med heat. This is an awesome recipe, it will be in tbe rotation. Thank you so much for all the delicious recipes and ideas. Can’t wait to try tbe orange “chicken”. That woild be a wonderful Easter dinner. I made these tacos for dinner tonight and I have to say, “Thank you!! !” We had the Cashew Sour Cream sauce that you suggested only I made mine with Macadamia nuts since that’s what I had. Wonderful! My hubby was so happy, we’ll be making these often. Made the meat today with pistachios instead of walnuts and a premixed taco seasoning. Delicious! Thinking of just letting it marinate and leaving it raw instead of baking for next time. Thanks for the recipe! It tastes delicious raw. I’ve eaten it both ways and it’s excellent. YUMMMMMMMMMMMMMMMMMMMMMMMMMMMMMMMMMMM!!!!!!!!!!!!!!!!!!!!!!!!!!!!!!!!!!!!!!!!!!!!!!!! I just made the cauliflower taco filling and the ‘sour cream’, but I used some dehydrated chilis I had on hand. Scrumptious! I made this and mixed it in a homemade veggie chili for chili mac…my husband didn’t even know it wasn’t real ground beef!! Loved it! I just made these tonight and subbed black beans (pulsed in the food processor), used low sodium Tamari instead of soy sauce, and omitted the salt and walnuts. It was still amazing! Thank you Sally. I will try it your way next time. Just made this tonight and it is delicious. I toasted a piece of bread, put guacamole on it first, then these crumbles, and topped it with sliced tomatoes. Yum! Tomorrow night, I’ll have traditional tacos with it. Thank you for this easy and very tasty recipe. I made these the other day (and have been enjoying the leftovers for my lunches), and oh my goodness, they were delicious! This is our new favorite taco recipe, and we take taco Tuesday very seriously around here, ha! My meat-eating husband even commented on how freaking good they were. Thank you!! This is one amazing recipe! I am Vegan/Whole Food Plant Based through and through and I never ADD oil to anything and I don’t like meat substitutes per say but this recipe is AMAZING! This tastes like “meat” you could serve it to your favorite Vegan or your favorite Carnivore anyone would love this recipe! 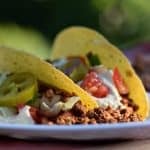 Fantastic recipe, my pickiest eater LOVED these tacos!! Thanks so much for a great, fast dinner idea!! I made these for the first time last night and oh my goodness, they were soooo good! These will definitely be in my dinner rotations at least once a week, but likely more often. Thank you for being so creative and making up for those of us who have limited culinary skills. You rock! i love this recipe and have made it several times for taco salad. i’d like to adapt the spices to more of an asian taste, something that would work well in steamed dumplings, along with cabbage, carrots and scallions. any ideas on how to season this differently? ginger and garlic? powered or fresh? would this even work? Anything that tastes good to you “works” in any way you want to eat it, that is a stupid question. This is not at all a stupid question. Adapting recipes to your own taste is intimidating at first. Receiving rude responses doesn’t help build confidence in cooking. Thank you for saying that! I read it and thought ” Wow!”smh. That was extremely rude!! Childish… we are all adults. I would take the first three ingredients for the cauliflower “meat” & then add in all the yummy Asian spices that you love. Ginger & garlic would work in either fresh or powdered form. Soy sauce, Gochujang, sesame oil, etc… Anything you love putting in ground beef would definitely work here. I plan on making the “meat” base & mixing it into a yummy Asian sauce to put into lettuce wraps. How about some Chinese five-spice with fresh ginger, garlic, and Sriracha to taste? I will be trying this as dumpling filling. Thanks for the idea, Sarah! Do not put all the cauliflower or mushrooms into the food processor at once, otherwise there will be big pieces that will not get cut until the rest has been chopped down too finely, so in the end it will be like a paste if you put too much in. Put smaller amounts in bit by bit, then remove so you get the ground beef size pieces. It is ALL your fault, you didn’t follow the recipe correctly or you are too incompetent to understand it to begin with. Jo, really? Someone doesn’t like a recipe and you have to be so demeaning? So if she had been a competent, correct recipe follower she and her husband would be guaranteed to like it? That doesn’t make sense and it doesn’t account for different tastes. Some people will like some of Chuck’s recipes, and some won’t. It doesn’t mean he or the recipe is “bad,” it just means someone didn’t like it. Period. And that’s okay. What’s not okay is your response to her. Holy cow! You have no idea how to interact with people. If you’re going to post in a public forum, have a little bit of decorum and humility for crying out loud. You are one deranged monkey! Just an FYI we use this “meat” as a base for sloppy joes. We cook it with bone sucking sauce, put it on a great whole grain bun add some onion and pickle and super yummy. Amazing recipe for the “meat” and I use it in chilli, stir-fry, sheppard’s pie, etc. I’m going to try this . I’m the only one in my family that will eat it. Can this mixture be frozen? Hi Chuck. When you say 1.5 cups of cauliflower – can I assume you mean after it’s been riced? I made this last night and think I didn’t use enough cauliflower – the seasonings seemed really strong. 1.5 cups after it’s riced would probably result in more volume than 1.5 cups of florets. I winged it and need to work on my technique a little next time. BUT that being said, my family really enjoyed this including the finicky teen son. He even took leftovers in his school lunch today. I’m so glad I found your site – I think there are LOTS of your recipes that will be approved by the hubby & teen son. Thanks. Use however much you feel you need to make them taste good to you. But yes, 1 1/2 cups of riced crumbles is what I think I used. The video, the written explanation, and the ingredient list did not match. For example, in the video you say a couple cups of cauliflower; in the ingredient list, it says 1 1/2. I would find it less confusing if they all matched. Nevertheless the end product is delicious! Thanks! Hi Chuck, I love your cauliflower taco meat, it’s so yummy. I want to make a huge batch of it, it I was wondering if I can freeze it for later use? I found a recipe like this last month and made it for my family. It is truly no-lie amazing. So. Damn. Good. I live in New Mexico and make my own corn tortillas and salsa fresca. With this recipe, my homemade tortillas and salsa shine. Soooo yummy. I omit the mushrooms and add a few minced chipotle chilies in adobo. I also throw chopped avocado and cilantro on each taco. ¡Qué bueno! This is delicious and it freezes very well, for those who asked. I had similar results and followed the recipe to a T. I felt it was just way too dry with too much spice. I like my taco filling to have some moisture to it. We did finish it though and did enjoy the taste combo of cauliflower, mushrooms and walnuts. Oh, this is excellent. Made it tonight for dinner and I absolutely loved it. I cut the recipe as I’m the only WFPB in my household and it still made enough for leftovers tomorrow and plus I think I can freeze some too. I topped it with some vegan sour cream and it was delish! I think with the leftovers I will make it into a taco salad and add some avocado and black beans and top with salsa. Thanks for the great recipe. I feel like I really indulged, but it was so good for me. Thanks for posting this recipe! i’ve been looking for a good “meat-like” empanada filling that I can send to my kids strictly kosher parve school. Sounds great! Yum. Yum. Yum. This was dinner tonight, along with the Instant Pot refried beans. I substituted pecans for walnuts (my husband can’t to walnuts) and accidentally used 8 oz of baby bella mushrooms instead of 4 oz. VERY good. Thanks again! I made this again tonight. Instead of “ricing” a head of cauliflower I bought a 16 oz bag of pre-cut cauliflower. This made the recipe easier and much more likely I’ll make it repeatedly. So good! And easy. A definite keeper! Doubled the recipe and made loaded nachos with some of it. Yum! Enjoyed this last night on top of baked potatoes along with Fat free vegan kitchens Holy Moly Spicy chipotle sauce and Isa Chandra Moscoqitz’s Sanctuary Dip. We basically had a potato bar. Yes, it was amazing! My husband and two daughters age 10 and 11 loved it! Thank you, what a great idea. I can’t wait to try the cauliflower ‘meat” on a salad. This was no lie AMAZING. Made exactly as stated (well, I probably got liberal with the spices but that’s how I roll). I felt like the walnuts really brought the whole thing together and made it really hearty. It’s a fantastic base for any ground meat recipe I think- will try it again for knock off P.F. Chang’s lettuce wraps. I think some ginger and garlic and a little teriyaki or something could pull it to the sweeter side with no problem. This is great. I now make in triple batches and freeze. Saves so much time for supper. I use it for tacos, chili and stuffed bell peppers. I made these tonight and YUM they were delicious and I also made the green chili sauce which really is so much better than sour cream. I didn’t have any fresh green chili’s so I subbed with 2 small cans of diced green cjilisvand it worked well. Thanks for the great recipe. Great recipe, I love it. I baked mine probably closer to an hour, but only because I wanted it .more browned. I’ve already used it in tacos, tostadas and chili, and tonight it will be used in my spaghetti sauce. Time to make another batch. Oh my goodness, these are fantastic. With a crisped up corn tortilla, a little guacamole, and some pico de gallo? YUMMMM! This was delicious, thank you for sharing! Do you think this could be adaptable for bolognese? I’m sure…. I’ve already modified the spices to make a Country Sausage Gravy, so yeah. Have fun with it. Drool! That sounds delicious too and I hope you share that recipe- I’ll search the site for it. For the bolognese, bake in oven as stated then add to tomato sauce? Made this tonight. Enjoyed by carnivores also. Used riced cauliflower. Wonder if this can be made into meatballs? Maybe….but I do have an Italian Metaball Recipe using Bulgur. We LOVE this “meat.” I like to double the recipe but only add the soy sauce to the whole mixture. Divide it. Then season the one you will use today, putting the rest in the fridge raw. You can use the remaining half in biscuits and gravy or sloppy joe recipes on this blog. So happy I found this and tried it! Tacos were my favorite food before I gave up meat and this really hits the spot! Easy to make, wouldn’t change a thing! I’m very new to making vegan meals and cooked this as part of a vegan chilli for a dinner with friends. It’s so good they kept picking at it before the meal was ready and I ended up cooking it twice over the weekend! Was really easy too. Thank you! So I’m making this again tonight. The balance of flavors and texture is WONDERFUL!. Tonight I’m making rolled tacos. I’ll steam the tortillas, fill them, roll them up and crisp them in myy air fryer. Serve with pico,quac and taco sauce. YUM YUM! 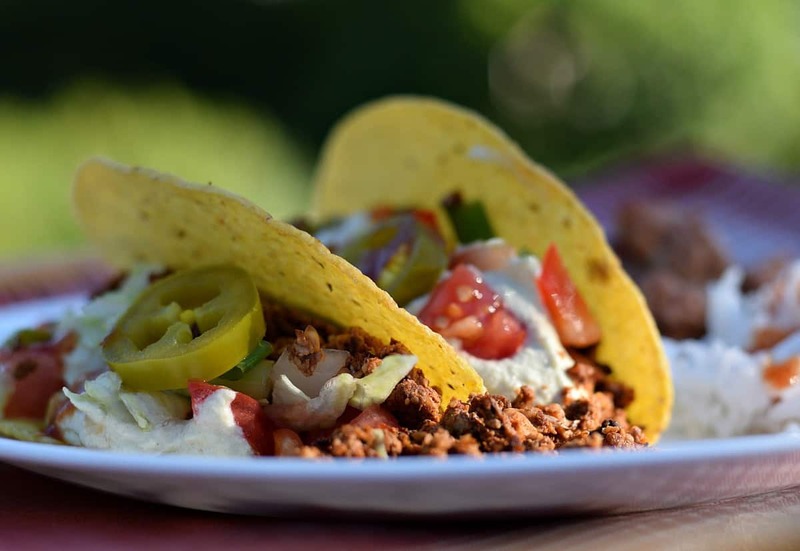 My go-to recipe for taco meat. I just really like this recipe. THANKS! My daughter and I made this tonight and it was great. The best mince alternative for tacos that we’ve tried, so much nicer than rice and beans or soy mince. Our new favourite meal, thank you. Can this be made starting with frozen cauliflower? If so, how would I go about preparing it? Thanks. Yes, and it can be made the exact same. Or you could let it thaw a little – your choice. P.S. Your recipes are awesome! This recipe is amazing! I made a double batch and it was so delicious. The only change I made was to substitute almonds for the walnuts as I am allergic to walnuts. It worked beautifully and I am glad I added them because it gave the meat just the right texture. This will be a staple in my fridge. I also love your carrot dog recipe and my next undertaking will be your biscuits & gravy. Thanks! Today I made this cauliflower mince for a Thai larb. I omitted the cumin and smoked paprika and after baking I dressed the mince with ginger, more garlic, lime juice, spring onions, coriander and mint and served it on amaranth leaves. Absolutely a winner, which I will serve to guests at some point. My husband is still raving how good it was “like real mince without the stinky fatty taste.” Thank you, Chuck. This was delicious. Wish I had doubled the recipe but wanted to try it first. Only change was instead of soy sauce used amino acid. So quick and easy if you buy riced cauliflower. I didn’t tell my husband it was cauliflower until he was done eating. He thinks he hates cauliflower. He said if you told me I woul be eating tacos with cauliflower as the meat and asking for more I would never believe it. He told me to make sure I didn’t lose the recipe. This is amazing recipe. We will be serving this again and again. Just made this. I added it to sliced Serrano peppers instead of a taco shell. Delicious! Thanks! Why the soy sauce? Only asking because I have a proclivity towards hypertension. Is it super necessary? 1)I like the flavor it adds, 2) it adds a little sodium, and 3) it gives the spices something to stick to. I do not like cauliflower. HOWEVER…this recipe converted me. Absolutely outstanding! I love cooking WFPB and my family loves tacos, so it was with great anticipation that I worked on this dish. The first person to taste it was my 9 year old who cried out that it was too spicy. Considering her age, I was only mildly concerned. Then my wife tasted it, and she gasped. She explained that it was not too picant but that the spices were indeed excessive. So I tasted it, and found they were both right. I believe it’s a cook’s responsibility to eat their mistakes, so I had seconds. If I were to try this dish again, I’d cut back on the chili powder and the smoked paprika, as their tastes dominated the palette. The cauliflower taco meat was fanatic! I made a double batch and have some left over. Do you think I could try adding the leftovers to some marinara sauce for spaghetti? Have you tried that? That’s exactly what I did with my Vegan Bolognese recipe. It’s on my website if you look it up. Ahhmazing! Best taco i’ve Had since turning Vegan last year! For toppings, we roasted a Pasilla pepper, peeled and sliced down. Also topped with guacamole and green onions. I ate more than I’ve eaten in months! Thanks for sharing! Considered myself not a fan of cauliflower but this recipe absolutely has changed the way that I think about it! Love this! Wow! These were incredible! I used more mushroom (b/c I didn’t want to have just a few over), added some oregano & used 1/4 cup walnuts. I freakin LOVED them! I used a cultured cashew cheese as a sour cream, guac, cilantro, tomato, green onion and of course cholula on top. I’m stuffed and I can’t wait to devour more tomorrow! I made these the other night and they were fantastic. I did modify the seasoning mix and only used one Tbs of chili powder and I thought it was perfectly seasoned. I’m baffled at why the mushrooms don’t get all wet and soggy?! Anyway, thank you. They were so good even my carnivore husband liked them! I made this and it was great! I think I added too many mushrooms which I didn’t like getting that mushroom taste. It does make plenty for left overs or freezing. We will definitely use this recipe again. Thanks! I made them today and with a little addition of lime juice they were perfect. This was so good! I tried another cauliflower taco meat recipe for my family a few months ago and they were not fans. They gobbled this one up though and even my meat eating husband mumbled, “So good!” as he munched on his tacos. We have a toddler and my chili powder and smoked paprika was a bit spicy so I halved those spices and doubled the onion and garlic powder. Worked out great! This will be my go-to cauliflower taco meat recipe from now on. I have made this twice; once with the spices as indicated and once reducing the smoked paprika to 1/2 tsp and the cumin to 1 tsp. I also used a 4 oz can of mushrooms instead of fresh both times. Guess what? Turned out great! Now…what do I do with the rest of the cauliflower…. Any idea how many this recipe will feed? Depends on how hungry you/they are. Some people will only eat 1 taco, others may have 3. There’s usually enough for my wife and I to stuff ourselves and still have a few leftovers for the next day. I doubled the recipe today reading that others had success freezing the mix. This is the third time I have made this recipe – the first time I astonished a friend who was convinced that I had given him a taco made from hamburger. I love the texture, the taste, and how simple it is to put together. I have been plant based and following The McDougall Program for almost 4 years, food has never tasted better and I definitely do not miss cleaning up a greasy kitchen. Thanks for another great recipe! Looooveeee this!!! I haven’t been eating meat for years and this surely satisfied everything craving I ever have. Thanks, Chuck. I made this a month or so ago and enjoyed it very much. I made a double batch a couple of days ago and had a little left to go into the freezer. I like having this as a base for several things so this morning I made up six batches to put into baggies and freeze. Easier for me since I have the ingredients out and the processor doesn’t have to be washed before using it again. Thanks for your dedication to creating recipes to make this WOE more pleasurable. I have served this to carnivores, vegetarians, and the response is always the same. THIS IS REALLY GOOD! I cheat and use taco seasoning, Your recipes Rock, Chuck. how long will this keep? i feel ive had it in my fridge for a couple of weeks now.. i love this stuff and don’t want it to go to waste. A few weeks? Uh – I’d personally toss it and make more. Next time freeze the leftovers. Wow! I just made this tonight and cannot believe how good it is. I was really worried it would be dry after roasting such tiny pieces, and no oil on it. But I think the walnuts have a bit of moisture due to their oil content. I used salsa and quacamole, and some black olives. I forgot to get lettuce, or fresh tomatoes which would have been great. It was just a little hot (spicy) for me, so I might reduce the chili powder for my own taste next time. Chuck, I’m wondering if you’ve ever tried this combination with Asian style seasonings, and maybe a little chopped water chestnuts to make lettuce cups? My mind is whirling with the possibilities! The texture is just wonderful! Thank you so much for sharing these recipes! These are my new go to tacos! I add some black beans and serve over rice or corn. Winner Winner. I made this today…an awesome crunch on my salad! . I did switch it up just a bit. Instead of 2 T of soy, I used 1 T each of liquid smoke and Worcestershire sauce. I’m not a fan of soy, and it cut back on sodium as well. Yum yum! This is so delicious and even my picky kid loves it! I’ve made it many times and will continue to! Love it! So glad I finally made this recipe! My son doesn’t like mushrooms or nuts, but he liked this taco filling. I put it on the table and didn’t tell anyone what it was in it. It got the “make again” vote from both hubby and son. I used a bag of frozen riced cauliflower, thawed and squeezed dry. I cooked it in my air fryer for 10 minutes on 350. Absolutely delicious. I am brand new only 3rd day of total plant based whole food for all my meals, but have been doing meals now and then for 2 months. Thank you! I also tried your carrot hot dogs on super bowl Sunday. Liked them very much as well. Again thank you. FYI if you are not doing salt you can just sub water and it does the same thing. Helps mix the spices up. Hi Chuck, I have a family member that is allergic to all nuts and seeds, except hemp and chia, I will be using hemp in this recipe. i’ll let you know how it goes. Thank you for all your fabulous, delicious, recipes! I did use Hemp seeds instead of walnuts, turned out great! Amazing…and I thought I was missing meat! Not today! Our family loved it! Could you.make it in a skillet or does it really need to be baked? Looking forward to trying it! I think it’s better when it’s baked.